In Four Feet, Two Sandals, two refugee girls share a pair of flip-flops since there aren’t enough shoes in their refugee camp. Instead of fighting over the sandals, they become friends. 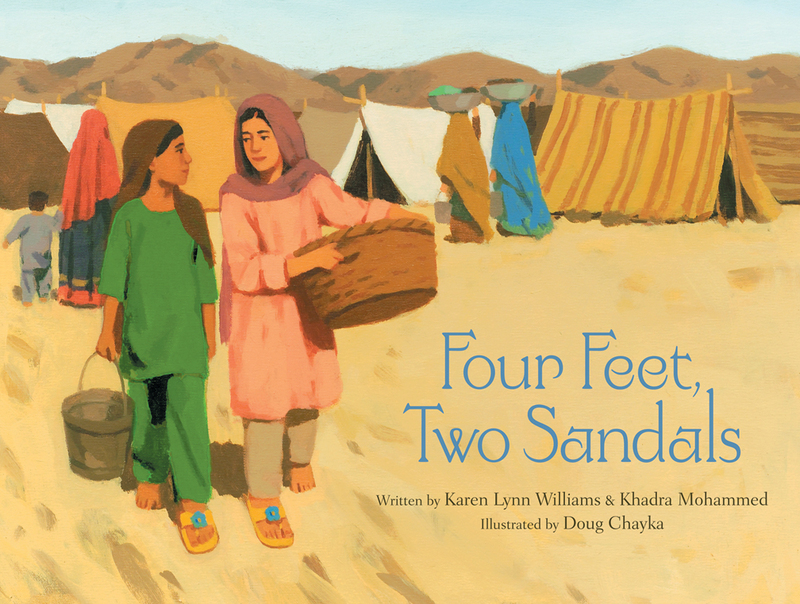 Read the book to learn more about the hardships refugees face and then create a sandal card to send to a friend or stranger far away. Step 1: Print & cut out both sandal templates. Step 2 (Optional—you can just color and decorate the top templates instead): Take top right sandal template and place it on colored or decorative paper and trace around it with a marker. Cut traced shape out of decorative paper. Step 3: Take top right sandal template and punch holes in the template where the 3 black circles indicate. If the hole punch can’t reach the black circle at the top of the sandal, fold the edge over a little and slide your hole punch over the folded edge. This should allow your hole punch to reach the circle. Step 4: Set the right sandal template with the holes on top of the shape you just cut out and use a marker to mark where the holes should be. Use a hole punch to punch holes into shape. Step 5: Take a piece of paper (it should be the color you want the majority of your card to be) and fold it in half along the long edge. You should end up with a fat rectangle, not a skinny rectangle. Step 6: Place the bottom right sandal template against the folded left edge of the paper. The top and bottom left edges of the shape should be touching the folded edge. Take a marker and trace along the edges of the template. Trace all edges except the top and bottom left edges that are over the crease. Step 7: Cut along the edges you just traced. This will be the main part of your right sandal card. Step 8: Take the top part of the sandal that you punched holes in and a piece of ribbon around eight inches long. Feed the ribbon from the bottom side though the top hole, then down to the hole on the right side of the sandal. Then feed the ribbon across the back of the sandal and up through the bottom hole on the left side of the sandal. Pull the ribbon to the top of the card and feed it back through the top hole again. Flip the sandal over, tie a knot in the two ends of the ribbon, and secure the ends of the ribbon to the back of the sandal with a bit of glue. Step 9: Spread glue on the front of the bottom right sandal shape and place the top right sandal shape on top of it. Step 10: Add any other decorations you wish. Step 11: Repeat the same process to create the left sandal. 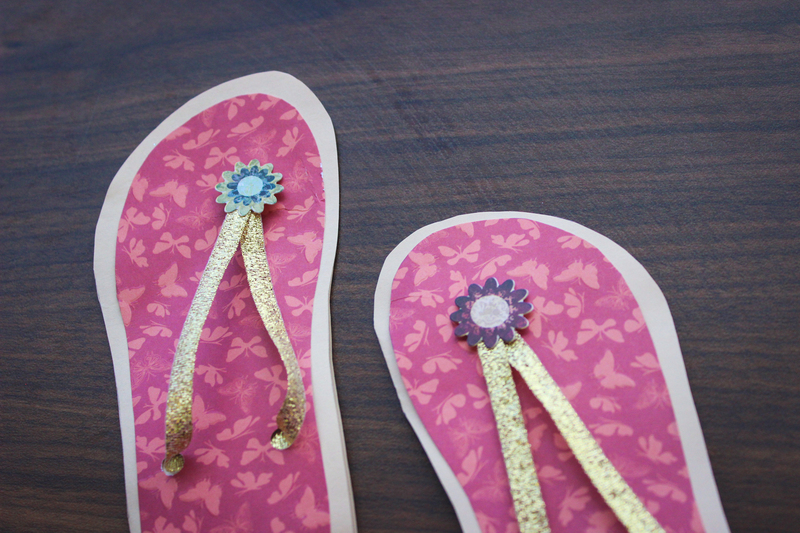 Step 12: Write a note on the inside and share your sandal with a friend or family member, just like the girls in Four Feet Two Sandals.